100% is a sweet sound to our ears. It means reaching the monthly support goal we set back in September 2017 to get to the Philippines to launch Haven of Grace Seminary. With a number of churches having taken us on for monthly support over the past couple of weeks, we are excited to announce that we are now at 100%. We are grateful to First Baptist (Las Animas, CO), Valley Community (Rocky Ford, CO), Westside Baptist (Eugene, OR), and Faith Baptist (Fowler, CO) for welcoming us into their Mission Families. This has been an amazing journey, and we are truly thankful for the pastors and church families who have partnered with us sharing the same vision to train national pastors for Gospel ministry in the Philippines and all throughout Southeast Asia. Over the coming weeks, we plan to arrange many of the details for our upcoming travels (we plan to fly out in the middle of May in order to launch the seminary at the very end of June). This includes purchasing airline tickets, applying for Visas, arranging for the purchase of a vehicle once we arrive, coordinating the seminary schedule, registering students, and a host of other details. We are seeking to raise $20,000 for our “Initial Travel and Relocation Expenses” to help cover many of these costs. The exciting news is that we have already raised close to $12,000 of this amount! If you feel led to contribute to this fund, please click on the “DONATE” tab on our website. You will be directed to the Pacific Rim Missions giving webpage. 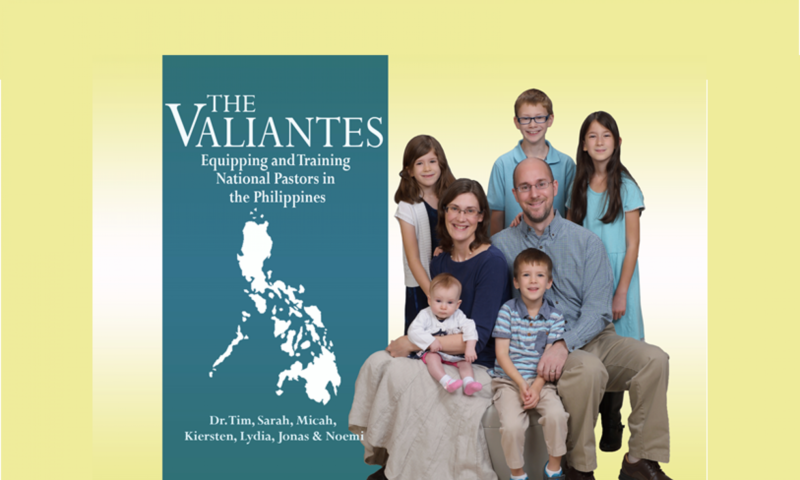 Just be sure to select “Missionary Support Fund-Valiantes” when making your donation. Thank you for your prayers for us as we make these final preparations. Great news! Praying for you. Loved the family pic.